Kumārajīva (Simplified Chinese: 鸠摩罗什; Traditional Chinese: 鳩摩羅什; Pinyin:Jiūmóluóshí; also Kiu-kiu-lo, Kiu-mo-lo-che, Kiu-mo-to-tche-po, Tang-cheu), (b. 344 C.E. – d. 413 C.E.) was a Kuchean Buddhist monk, scholar , and translator, famed for his encyclopedic knowledge of Indian and Vedantic learning. His father was from an Indian noble family, and his mother was a Kuchean princess who significantly influenced his early studies. When his mother, a Kuchean princess, became a nun, he followed her into monastic life at the age of seven He first studied teachings of the Sarvastivada schools, he grew up in centers of Hinayana Buddhism, later studied under Buddhasvāmin, and finally became a Mahayāna adherent, studying the Madhyamika doctrine of Nagarjuna. Kumarajiva is mostly remembered for the prolific translation of Buddhist texts written in Sanskrit to Chinese, which he carried out during his later life. In 383, Chinese forces seized Kucha and carried Kumarajiva off to China. From 401, he was at the Ch’in court in the capital Chang’an (the modern Xi’an), where he taught and translated Buddhist scriptures into Chinese. Kumarajiva’s career played a crucial role in disseminating Buddhist religious and philosophical ideas in China. He not only made available important texts that were previously unknown, but also did much to clarify Buddhist terminology and philosophical concepts. Kumarajiva’s father, Kumārāyana (also Kiu-mo-yen), was an intelligent man, descended from an honorable line of prime ministers of a kingdom in Kashmir. His grandfather Ta-to is supposed to have had a great reputation. Though Kumārāyana was expected to become prime minister after his father, he renounced his hereditary claim and became a Buddhist monk. Eventually, he set out along the silk route, which threaded its way across the mighty Pamirs and into the Takla Makan Desert and Central Asia. Following the northern route, he came in time to the devoutly Buddhist kingdom of Kucha on the northern rim of the great Tarim River basin. The Kuchan king either knew the reputation of Kumārāyana, or was a good judge of human character, and he welcomed the traveler warmly and made him a trusted adviser. Soon he was elevated to kuo-shih, Teacher of the Nation, a privileged position, which entailed political and cultural duties as well as religious functions. Jīva (or Jivaka), the king’s younger sister, had grace, wit, will and an exceptional intelligence. It was said that she had only to glance at a written passage to comprehend it, and only to hear something once to repeat it from memory. She had politely rejected a number of eligible suitors from neighboring kingdoms, but when she saw Kumārāyana she expressed the desire to become his wife. The king was delighted and insisted that Kumarayana accept the proposal. Although Kumārāyana had renounced the world and taken up the life of a monk, he bowed to the wishes of the generous and devout monarch. When their son was born around 343 or 344 C.E., Kumarayana and Jivaka each gave a part of their names to him and called him Kumarajiva. When he was six years-old, Jivaka received permission from her husband to become a Buddhist nun and joined the Tsio-li nunnery. According to tradition, Kumārajīva, in spite of his young age, had already committed many texts and sutras to memory. Kumarajiva’s mother recognized the intelligence of her son and determined to give him the best available philosophical and spiritual training. When he was nine years old, mother and son undertook the arduous journey to India, eventually reaching the Kashmiri kingdom known to the Chinese as Chi-pin, which was probably his father’s native home. Bandhudatta, a renowned Buddhist teacher and cousin of the king, instructed Kumarajiva in the agamas (the nikayas of the Theravadin tradition). Kumarajiva spent the next two years mastering these texts and was recognized by the king. After he defeated several non-Buddhist teachers in a debate held before the ruler, his reputation preceded him wherever he traveled. In addition to learning the scriptures and treatises of the Sarvastivadin school, Dīrghāgama and Madhyāgama, Kumarajiva took the opportunity to study Indian medicine, astronomy and astrology, exegetical and hermeneutical methods of exposition, logic and the applied sciences. You must watch over and protect this novice. If by the time he reaches the age of thirty-five he has not abandoned the rules of religious discipline, he will become a great propagator of buddhadharma, enlightening countless people, and he will be the equal of Upagupta (the fourth Indian patriarch after Buddha, who converted the emperor Ashoka to Buddhism). Kumarajiva and his mother spent a year in Kashgar, a Buddhist kingdom known for its excellent teachers and libraries, where he completed his studies of the Abhidharma and the texts revered by the Sarvastivadins under the Kashmirian Buddhayaśa. During this time he studied Vedic literature and the most important systems of chanting the Vedas, focusing on the power of sound to open the consciousness to transcendental truths. This knowledge later inspired his translations of sutras and texts into Chinese. He also expanded his knowledge of Sanskrit, Pali and the languages of Central Asia. On one occasion, a monk recommended that the king of Kashgar invite Kumarajiva to expound a sutra to a prestigious assembly which included the king himself. After he did this, the monks of Kashgar were indirectly compelled to reform their lax monastic disciplines. The king of Kucha, hearing of the high regard in which Kumarajiva was held in Kashgar, sent a delegation to confirm friendly relations between the two kingdoms. While in Kashgar, Kumārajīva met Sutyasoma, a prince of Yarkend (So-ch’e), who had renounced his royal inheritance and become a revered teacher. Kumarajiva held that the dharmas, or ultimate constituents of existence, are eternally real, while empirical phenomena, which arise out of the momentary confluence of dharmas under karma, are unreal. Sutyasoma adhered to the Mahayana view that all dharmas are themselves unreal; ontologically, dharmas are like empty space and assume distinct existence only in their momentary, ever-changing combinations. Sutyasoma’s more universal application of Buddha’s doctrine of impermanence won Kumarajiva over to the Mahayana school of Buddhism. Kumarajiva felt he had been emancipated, declaring that he had been like a person who, not knowing what gold was, had previously taken brass for something wonderful. At the age of 12, Kumārajīva left Kashgar with Jīva and traveled to Turfan, the north-eastern limit of the kingdom of Kucha, which was home to more than 10,000 monks. Kumārajīva’s reputation had preceded him as far as northern China, and monks from all over Central and East Asia gathered in Kucha to learn from him, though he was only 20 years-old and still officially a novice, or shramanera. Within a year he was made a full monk in the Sangha and spent much of his time teaching others. For almost a decade he prepared himself to undertake a mission to China. King Po-Shui of Kucha came to Turfan to ask Kumārajīva personally to return with him to Kucha city. Kumārajīva obliged and returned to instruct the king's daughter A-Kie-ye-mo-ti, who had become a nun, in the Mahāsannipāta and “Mahāvaipulya sūtras. At the age of 20, Kumārajīva was fully ordained at the king's palace, and lived in a new monastery built by king Po-Shun. Kumārajīva proceeded to study the Pañcavi-śati-sāhasrikā sūtra, one of the longer Perfection of Wisdom texts, relatively obscure at the time. He is known to have engaged in debates, and to have encouraged dialog with foreign monks. He received Vimalākra, a Sarvāstivādan monk from Kashmir, and was instructed by him in the Sarvāstivādan Vinaya Buddhist texts. The Kuchan state was in a steady decline, and incessant internal struggles plagued northern China. Observing this, Kumārajīva’s mother Jiva, who believed she had done all she could for her son, exhorted him to follow unwaveringly the Bodhisattva Path and left him to return to India. They never met again. In 379, Fu Chien or Fu Jiān (苻堅) conquered the city of Hsiang-yang or Xiangyang (襄陽, in modern Xiangfan, Hubei) and brought the monk Tao-an to his capital at Ch’ang-an (長安), where he established a famous centre for the translation of Buddhist scriptures and texts. Hearing of Kumarajiva’s spiritual, philosophical and linguistic abilities, Tao-an urged Fu Chien to invite him to Ch’ang-an. The warlord-emperor sent Lu Kuang (Lü Guang, 呂光) with an army to march on Kucha and seize Kumarajiva. Kucha fell to Lu Kuang, and Kumarajiva willingly set out with the conquering general for Ch’ang-an in 383. However, events took a different turn. In 385, Tao-an died, and six months later the Yao family conquered Ch’ang-an and killed Fu Chien. The new dynasty continued many of the previous rulers’ policies, preserving Tao-an’s translation center, encouraging Buddhist studies, and anticipating Kumarajiva’s arrival in the capital. When Lu Kuang heard of the conquest of Ch’ang-an, he halted his return, declared himself independent, and set up a state known as the Later Liang (後凉), with its center at Ku-tsang. Lu Kuang was not a Buddhist, but he recognized the political value of Kumarajiva. Lu Kuang held Kumarajiva captive for 16 years, retaining him as a military adviser and subjecting him to numerous indignities, while the rulers of Ch’ang-an pleaded unsuccessfully for his release. Kumarajiva found this situation difficult and frustrating, because he was ridiculed for his Buddhist practices and was unable to undertake the work he believed he was destined to perform. However, he used this time to learn about China from the soldiers who had marched across much of the country. He gathered texts to take with him to Ch’ang-an, and thoroughly mastered the Chinese language. In 401, Yao Hsing (Yao Xing, 姚興), second ruler of the new dynasty at Ch’ang-an, grew weary of fruitless negotiations with Lu Kuang and attacked and conquered Ku-tsang. Kumarajiva was rescued unharmed, and in 402 he was welcomed to Ch’ang-an. Yao Hsing warmly received Kumarajiva and gave him the title “Teacher of the Nation.” This phase of his life, which has profoundly influenced Chinese Buddhist tradition, lasted barely a decade. Within six days of his arrival in Ch’ang-an, at the suggestion of a monk named Seng-jui (later one of his chief disciples), he began to translate a text on meditation, the Tso-ch’an san-mei ching. The translation centre founded by Tao-an had been preserved and supported by Yao Hsing, and Kumarajiva found himself surrounded by a large group of knowledgeable monks who were ready to continue the work of translation under his guidance. He reorganized the center so that new translations could be made while previous translations were being reviewed and revised. Within the next few years he translated almost 50 works, in about 300 volumes. Kumarajiva’s influence was not limited to the so-called barbarous kingdoms of northern China. In 378, Hui-yuan (慧遠), one of Tao-an’s chief disciples, had gone south and founded a monastic community at Mount Lu-shan. Within a few years, he became the informal leader of the Southern Chinese Buddhist community. Shortly after Kumarajiva’s arrival in Ch’ang-an in 402, Hui-yuan began a correspondence with him and encouraged him to continue the work of Tao-an. A year later, when he heard that Kumarajiva might return to Kucha, he wrote again, strongly urging him to remain in China. Eighteen exchanges between the two monks on philosophical and monastic subjects survive. Hui-yuan was most interested in gaining a clear understanding of the dharmakaya, the highest vehicle of a Buddha. 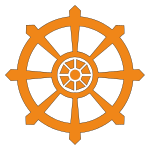 Kumarajiva distinguished between dharmakaya, the ultimate body of Buddha, and dharmadhatujakaya, the invisible body consciously evolved by a Bodhisattva to serve humanity in the world even after physical death. He showed how ultimate reality is reflected in subtle material form through universal consciousness. These letters, answering questions posed by a serious disciple of buddhadharma, illustrate Kumarajiva’s own profound insight and understanding, though he usually avoided writing about his own views and preferred to work on translations. Yao Hsing, deeply impressed with Kumarajiva’s political acumen, intellectual ability and spiritual depth, thought that the offspring of Kumarajiva and carefully selected maidens would be as brilliant and talented as their father. He insisted that Kumarajiva move out of the monastic community into a private house staffed by female attendants. Although Kumarajiva was repelled by the experiment, he knew that refusing to obey his emperor would jeopardize the security of the translation center. He complied with Yao Hsing’s orders but, concerned about the effect his actions might have on the monastic community, he compared himself to a lotus growing out of the mud and urged the monks to attend to the lotus and ignore the mud. Apparently the community understood his predicament as an example of self-sacrifice in pursuit of the Bodhisattva Ideal. The children resulting from Yao Hsing’s experiment disappointed his expectations. According to tradition, when Kumarajiva lay on his deathbed, he told his closest disciples that his cremation would reflect his success as a translator. If he had made errors, the funeral flames would consume a his entire body. If, however, he had not made errors, his tongue would remain untouched by the fire. His disciples testified that his tongue survived the cremation of his body unharmed. Like Tao-an, Kumarajiva thought that the ko-i or ‘matching the meaning’ method of translation, in which unfamiliar Sanskrit Buddhist concepts were replaced by well-known Chinese Taoist words, compromised Buddha’s teachings. However, when reviewing Tao-an’s work, he realized that too strict an insistence on literal translation, which sometimes required the creation of awkward neologisms, rendered beautiful texts obscure. He believed that a translation should accurately convey the tone and texture of a teaching inseparably from its content. Kumarajiva adopted a new methodology for translation, emphasizing the central theme of a text and editing the passages which would seem unnecessarily repetitive to Chinese readers. He would assemble a large working force, then read a text aloud to them, sentence by sentence. Yao Hsing would often attend these sessions, and sometimes held the original palm-leaf manuscript in his own hands while Kumarajiva explained it. After each sentence, Kumarajiva would explain its meaning and offer an oral translation in Chinese, and the congregation would make comments and suggest improvements. The approved translation was then written down, and reviewed by an editor for style and internal consistency. Finally, a calligrapher would correct the Chinese ideographs to be sure there were no ambiguities in transmission of the texts. The collective work of Kumarajiva and his colleagues produced texts which were readable, comprehensible and inspiring. His work became the foundation of the great movement of Buddhist thought and teaching that arose in China, even as buddhavachana began to decline in India. More than one hundred translations are attributed to Kumarajiva. Of these only about twenty-four can be authenticated, but they include some of the most important titles in the Chinese Buddhist canon. Kumarajiva’s career had a formative influence on Chinese Buddhist thought, not only because he made available important texts that were previously unknown, but also because he did much to clarify Buddhist terminology and philosophical concepts. He and his disciples established the Chinese branch of the Madhyamika, known as the San-lun, or “Three Treatises” school. His translations are still read and studied today, and they are often used as the basis for new translations into other languages, including English. Kumarajiva translated a range of sutras and commentaries from a variety of Buddhist teachings, such as the Prajnaparamita literature, the Vimalakirti Sutra and the Surangama Sutra. His most famous and influential work was his rendition of the Lotus Sutra, known in Sanskrit as the Saddharma Pundarika Sutra and in Chinese as Miao-fu lien-hua, which combines Kumarajiva’s linguistic facility and his profound grasp of the scope and depth of buddhadharma. The translations never could have taken place without the remarkable support that Yao Hsing gave to the project, and without the enthusiastic cooperation of the scholarly monks, whose contributions Kumarajiva never hesitated to acknowledge. Kumarajiva had four main disciples: Daosheng (道生), Sengzhao (僧肇), Daorong (道融), and Sengrui (僧叡). Kumarajiva, Bhikshu Wai-tao, and Dwight Goddard. 1935. The diamond sutra, a Buddhist scripture. Santa Barbara, Calif: D. Goddard. This page was last modified on 25 April 2018, at 15:04.